Mind Games by Nancy Mehl is a contemporary Christian suspense that had me glued and guessing from the start. Wow, it was fabulous. I read with heart racing and mind whirring to the jaw dropping conclusion. The suspense is heightened from the beginning as the reader already has questions about trust and true character. Trust has to be earnt. As the lead character begins the journey to trust, the reader walks alongside. A major theme is that of protection. We follow the FBI and law enforcement agencies that are set up to protect the public. There is also a microcosm trip to trust. “Someday you’ll have to let someone in… I realise you’re trying to protect yourself.” Keeping others out may be intended to protect but the reality is that we will live lives in grand isolation. Life is not meant to be done alone but in community with others. Police work, like life, is about teamwork and cooperation. “It’s not about the territory. It should be about finding the truth.” Information needs to be shared. Just as in life, problems need to be shared. People we trust make the journey of life more pleasant if we walk the road together. The novel is about searching for the truth. The reader, along with the characters, tries to piece the clues together to solve the crimes. Mind Games is a thinking person’s suspense. It is not a novel you can stroll through but one that will heighten your senses and raise your levels of suspicion. I suspected many characters – what I didn’t expect was the final page – definitely a ‘wow’ moment – utterly brilliant. No cheating and turning to the last page though, it won’t make sense without what goes before. Whilst the FBI search for the perpetrator, the reader is reminded that God searches for us. He never leaves us alone. He is available for all. No one is ever disqualified from knowing God. “He [God] speaks to everyone who will listen.” When we know God, we can know peace. Even when we walk through the valley of evil and the fires of hell, God’s peace and presence will carry us through. 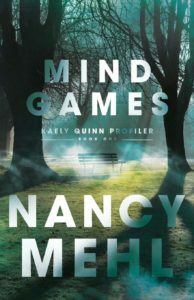 Mind Games was my first read by Nancy Mehl – and it blew me away. I will definitely be reading more by her. As we end 2018, I am very glad to see my reading journey going out a bang and not a whimper. Thank you Nancy Mehl, a fantastic nail biting read.